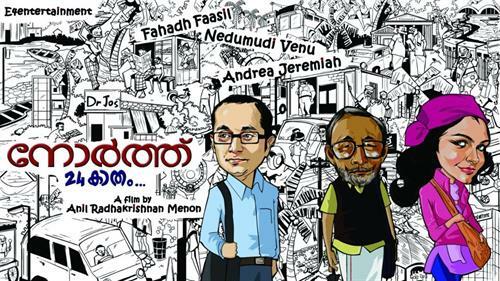 After the megaton success of Annayum Rasoolum, Fahadh Faasil and Andrea Jeremiah are pairing again for a movie which does have all the flavours of a commercial entertainer. Titled 'North 24 Kaatham', this movie is written and directed by Anil Radhakrishnan. E-4 entertainment which had cashed for Annayum Rasoolum, will produce the movie which is told to be a fun filled emotional voyage. The movie also features Nedumudi Venu in a prominent role. 'North 24 Kaatham' revolves around the three strangers from different background who have to travel together for a whole day. It would be very strange for all of them to adjust with the surrounding as they don't have any prior acquaintance with each other. After the initial difficulties, the journey takes to the next phase filled with laughter and enjoyment. Rest of the story travels through an atmosphere filled with fun and emotions which make the voyage interesting. The movie will be a clean entertainer which would keep the viewers intact. Another attracting feature of the movie would be the presence of Govind Menon who would lend his magical fingers to render the music. The Cinematography of the movie is safe in the hand of Jayesh Nair while Dilip Dennies would take the opportunity to show his editing skills in the studio. C.V. Sarathi serves as the executive producer while Sameer Saneesh is in charge of delivering the costumes. Ranjith Ambadi(Make Up), Sagar( Associate Director) and Sreekumar A.D (Production Controller) will stay behind the screen with backbone support to the movie. El Tremendo will set the designs for 'North 24 Kaatham'. As Fahadh Faasil - Andrea Jeremiah paired 'Annayum Rasoolum' was the first hit of 2013, this movie too is expected to win gold for the young actor. Among the 5 movies of Fahadh released this year, 3 of them had strike gold while the other two got applause for his acting brilliance. Fahadh who is having a busy schedule in 2013 is having a number of projects in kitty. His upcoming ventures are Anchu Sundharikal, Olipporu, Artist and 2 untitled projects with Sathyan Anthikad and Gautham Menon.